Courses are suitable both for beginners and those with previous experience. There is a maximum of ten people for each class. It is a good idea to wear old clothes, aprons or overalls and remember to bring your own packed lunch. To sign up for any of these courses please call (see Home Page or below) or email Clare. A deposit of 50% will secure a place. The drawing course is also for beginners as well as those with experience. We will explore different approaches to drawing, the idea being to get to the essence of the thing rather than just to copy it. Thursday 6th Friday 7th December. Drawing Course, boards and easels provided. To sign up for any of these courses please call or email Clare. A 50% deposit of £85 will secure a place. 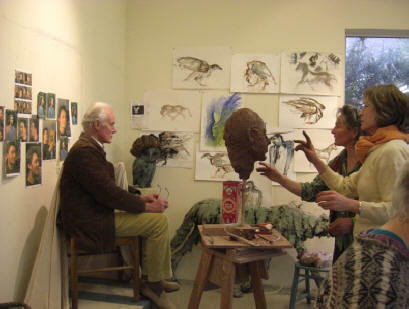 These two and three day sculpture courses will be held here in the studio from 10 – 4. 30. There will be a model to work from and we will go through the process of observing the form, making an armature and modelling in clay, wax or plaster. The model will sit from 11-1 and 2-4. 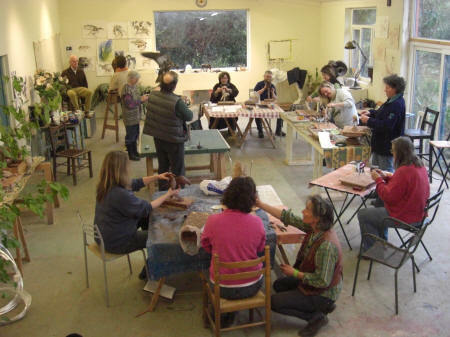 Cost for sculpture courses is £170.00 (plus materials for sculpture courses, usually about £20) The three day plaster course is £255.00 plus materials. Thursday 24th & Friday 25th January. Sculpture working from an animal model. Thursday 14th & Friday 15th February. Sculpture with a life and animal model. Thursday 21st and Friday 22nd March. Sculpture with an animal model. Thursday 25th and Friday 26th April. Sculpture with an animal and a human model. Thursday 16th and Friday 17th May. Sculpture with an animal model. There will be a maximum of ten people for each class. It is a good idea to wear old clothes, aprons or overalls and remember to bring your own packed lunch. To sign up for any of these courses please call or email Clare. I look forward to seeing you next year, meanwhile Happy Christmas!